Carfax Certified. 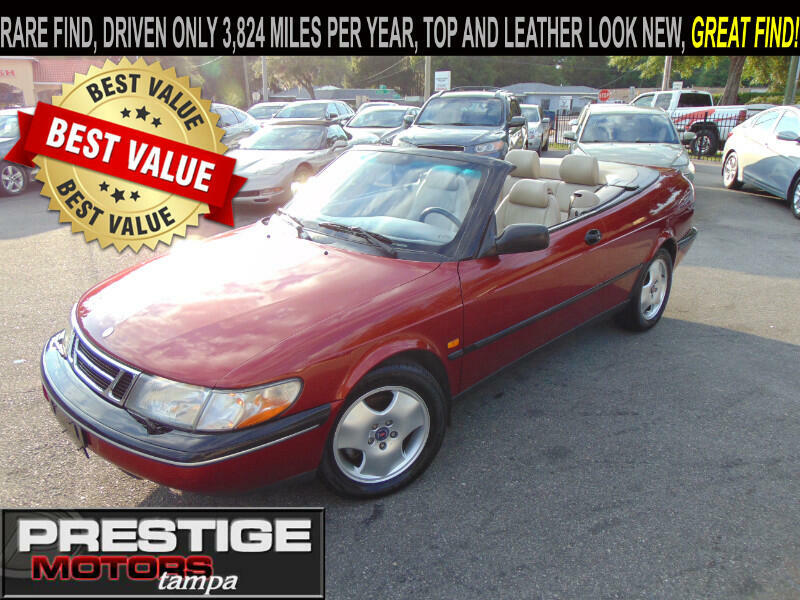 Hard to Find Saab 900SE Convertible. Driven Only 3,824 Miles Per Year. EXTREMELY CLEAN! Power Top Works Perfect. Top Looks New. This vehicle was garaged and it shows. Power Heated Seats. Red over Beige Leather Interior. 4-Cylinder Turbo Engine. Automatic Transmission. Radio Knob is missing and inop. Other than that everything is great! We Offer Free Pickup from Tampa International Airport. We also offer the very best value and better service with better financing options. At Prestige Motors Tampa, we are here to ensure you the very best savings possible! Please call us at 813-908-9191 to learn about how you can get more for less. WITH OVER 500 POSITIVE REVIEWS Across the Internet and on Google demonstrates how we treat our customers and how they perceive our passion to ensure all customers receive the very best for way less than the competition. Prestige motors Tampa is located one mile north of Bearss avenue at 16417 North Florida Avenue. Trades welcome. Please visit our website www.prestigemotorstampa.com. Thank you in advance for your consideration. Our team looks forward to earning your business. Visit Prestige Motors Tampa online at www.prestigemotorstampa.com to see more pictures of this vehicle or call us at 813-908-9191 today to schedule your test drive.